Faculty keep their own calendars, students may contact them directly for an appointment. Scroll down for full time, part-time, and emeriti faculty. Please note that most of our full-time faculty have very limited availability during the summer months. Dr. Boilard has many years experience in the California Legislative Analyst's Office, directing the office's work in higher education policy. Prior to his work at the LAO, he spent five years as a professor of government. He has also worked as an analyst at the state Department of Housing and Community Development, and served as an intern in Sacramento and Washington, D.C.
Steve holds a Ph.D. in political science from the University of California, Santa Barbara, and an M.A. in Government from Sacramento State University. Mr. Booher studied planning at the University of Tennessee and political science at Tulane University. He is a reitred Planning and Policy Consultant and Fellow of the American Institute of Certified Planners. Among his many professional activities, David has provided advisory and consulting services in collaborative policy making to CSUS, the Center for Collaborative Policy, California Department of Water Resources, the Irvine Foundation, and the Hewlett Foundation. Mr. Detwiler studied public policy and administration at the University of Wisconsin, Madison and government at Saint Mary's College of California. For nearly 40 years, Mr. Detwiler analyzed state and local public policies related to land use, public finance, and government topics. 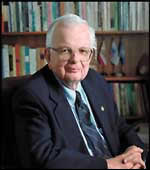 Dr. Gerth served as President of California State University, Sacramento from 1984 - 2003, after which he retired into the Department of Public Policy and Administration. His presidency was the longest in the history of the University to date and his career in the California State University system spans more than 4 decades. His distinguished presidency shaped California State University, Sacramento in many significant ways. Dr. Gossett earned his Ph.D. in political science from Stanford University. His areas of interest are in public sector human resources management, state and local intergovernmental relations, and African politics. He has taught in our public management and administration series of classes. Donations can be made to the Timothy A. Hodson Scholarship Fund at Sacramento State at the University's donation page. At the top of the page select "College of Social Sciences and Interdisciplinary Studies" then “Tim Hodson Scholarship” before completing the rest of the form. Tim Hodson, PPA Professor and Center for CA Studies Director, passed away October 25, 2011 from cancer. Many knew Tim as the instructor of the PPA elective on “Working with Legislatures,” as a master’s thesis advisor, and/or as the Director of the esteemed Capital Fellows Programs at Sacramento State. His passing is a loss to all in the Sac State PPA Community. His good humor, amazing historical and institutional knowledge of California politics, and strong professional commitment to good government and educating the people of CA on how best to achieve it, will all be greatly missed. Dr. Jensen is a graduate of the University of Southern California. Her specialty is public management and intergovernmental relations. She is experienced in program administration and evaluation at federal, state, and local levels of government. Dr. Jensen is the 2007 recipient of the prestigious John C. Livingston Award. She delivered the annual Livingston lecture on October 30, 2007. Dr. Kirlin earned her doctorate and her master's degrees at the University of Southern California. Prior to joining our faculty, her work included positions at Indiana University and the California State Capital. Dr. Moulds earned her bachelor's degree from Sacramento State College. She earned her master's degree from the University of California, Berkeley as a Woodrow Wilson Fellow, and her doctorate from the University of Southern California. Her area of specialization has been American politics and policy. Dr. Shulock studied political science at the University of California, Davis and public policy at the University of California, Berkeley. Her specialties are public policy, higher education policy, public budgeting, and public management. Before her retirement in 2014, she served Sacramento State for more than 30 years as an academic administrator, responsible for planning and budgeting, and later as the Executive Director for the Institute for Higher Education Leadership and Policy. Dr. Waste earned his bachelor's and master degrees from California State University, Sacramento and his Ph.D. from the University of California, Davis. His specialty is Urban Public Policy, Political Economy, and Management, and State and Local Government. His previous teaching assignments include California State University, Chico, San Diego State University, and Brown University.